The Black Cohosh, or Black Snakeroot, grows in rich woods from Canada nearly to the Gulf of Mexico. It is a conspicuous plant, with its long stem, which sometimes grows to a height of eight feet, and its large compound leaves, as well as with its long raceme of numerous small white flowers. This raceme during the ripening of the fruit often acquires a length of two to three feet. This plant is sometimes called bugbane. 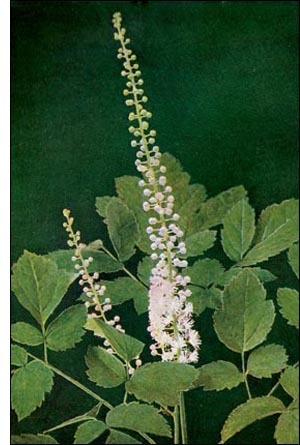 The black cohosh is held in high repute by some Indians as a cure for the bite of poisonous snakes, as well as powerful aid in driving away insects. Were it not for the strong, disagreeable odor of the flowers, which are only frequented by those flies which enjoy the odor of carrion, with its "tall white rockets shooting upward from a mass of large, handsome leaves," it would be a striking ornament for the flower garden.